Kanye West. New album. Need I say more? Whenever Kanye West goes into album mode, the phenomenon known as Yeezy Season is always one of the most intriguing storylines regardless of what the subsequent album has in store. From GOOD Fridays to Twitter rants, music’s most controversial figure makes headlines for weeks and months leading up to a release date. With his eighth studio album, the rollout may have been one of the most controversial of any of his projects. From the support of Donald Trump to interviews with Charlemagne the God and TMZ, Kanye has not been quiet at all in the time preceding his album. People who follow him both as a musician and as a person had one question on their mind leading up ye: How would these comments play into his record? West had so many directions he could go in, and he ended up picking one of the most unexpected directions possible on ye. While the lead up was spent dealing with drama due to Kanye’s interactions with other people, this album is all about Kanye. It’s almost as if Ye has taken his brain out of his head and let listeners get a firsthand glance at what is happening inside of it. Kanye tackles so many issues that plague him on this seven track mini-album. He always make albums about himself, but this takes it to a whole new level. Every aspect of his braggadocio was stripped away on this album and we get raw and emotional Kanye. 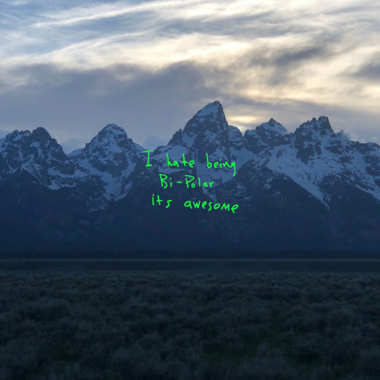 On the first two songs, “I Thought About Killing You” and “Yikes,” West doesn’t just dip his toes into his bipolar depression, he cannonballs in and he references it directly on the latter of the tracks. Kanye brings up suicidal thoughts that he has experienced and killing “you,” which just so happens to be Kanye himself. That thing is love, which is tackled on the other four songs on the project. On the track “All Mine,” the first verse by Kanye talks all about cheating, a topic that has been explored on numerous occasions throughout Ye’s discography. The next two, “Wouldn’t Leave” and “No Mistakes,” are all about the questioning of love on the first song and the confirming of love on the second. Kanye’s songs talking about his relationship with his wife, Kim Kardashian-West, have been some of Kanye’s most compelling on his last two albums, Yeezus and The Life of Pablo. The point of view that he uses in these songs make his relationship songs extremely vivid and complex pictures of love. The final song, “Violent Crimes,” is sort of a “Bound 2,” made out to Kanye’s three children. The song is very heartfelt and overprotective, as a father should be. He wants to let go, but he knows that his kids need him more than anything. Overall, this album has the makeup of a classic and the production on it is very Kanye, with smoothly layered chopped up soul samples and witty double entendres. The only thing that holds this album back is the features, but that is only a small handful. The hook on “All Mine” is very mumbly and odd from R&B singer Valee and the intro from Partynextdoor on “Wouldn’t Leave” sounds like a Young Thug rip-off. But that is my only complaint. I think this is Kanye’s bravest album and, much like his counterpart Jay-Z on 4:44, he stripped back his layers and showed his true self. This album is a solid listen multiple times over.